“My husband used to tell me who to vote for; now I tell him that I can read the names and will choose who to vote for myself”. “When I went to town I was embarrassed to ask someone where the doctor's was. Now I can read the signs myself”. “I feel more confident when communicating with others, introducing myself to people, and I can write letters and keep records in my home”. Nepal is one of the world's most beautiful countries. It is home to the stunning Himalayan Mountains, years of rich history and warm, friendly, hard-working people. Nepal is also one of the poorest countries on earth and its people — especially its women — suffer from low literacy rates. WELNepal has been helping women of all ages in the lowlands of Nepal learn to read and write in their language since 1996. Over the years, we have seen the incredible impact literacy classes have on people. The classes don't just teach women Nepalese ABCs — they imbue them with confidence and ambition. Literacy doesn't just open doors for Nepalese women, it obliterates barriers. 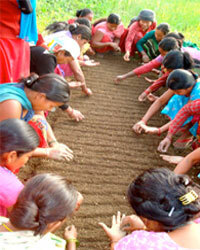 Click here to learn more about WELNepal.